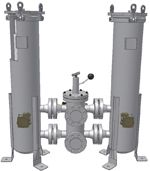 DFH high pressure duplex operating pressures up to 3000 psi / 210 bar and flow rates up to 58 gpm / 184 lpm with DFE rated glass media element options. 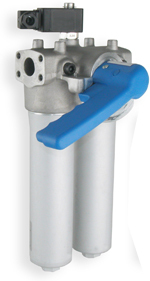 DFH allows for element servicing without interrupting must have continuous hydraulic system operation. Ideal for critical hydraulic systems such as HPU pump discharge, power gen EHC systems, wind turbine and marine hydraulics. DLF / DLFM high flow duplex assemblies with operating pressure options uo to 1,500 psi / 102 bar are available in coated steel or stainless steel materials to suit any fluid. Hy-Pro DFE rated coreless elements are available in a wide range of medias to handle any application from high viscosity lubricants to diesel fuel. 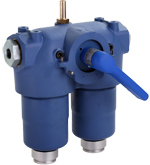 DLF / DLFM duplexes allow filter element servicing without interrupting must have system flow and are ideal for critical high speed bearing lube pumping skids and other high flow applications.